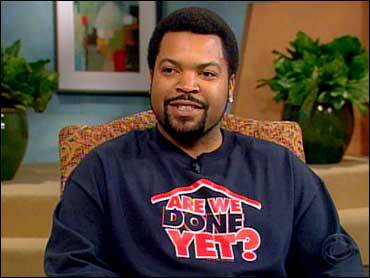 Ice Cube Is Still Not "Done Yet"
Two years ago, rapper and actor Ice Cube played Nick Persons in the hit comedy "Are We There Yet?" Now he is reprising his role in the follow-up "Are We Done Yet?" in which he moves his family to a fixer-upper in the country. The movie, based on a 1948 Cary Grant classic "Mr. Blandings Builds His Dream House," tells the tale of a family whose new home is besieged by problems, inflicted upon them by nature and a contractor played by John C. McGinley. "A lot of people didn't really remember that movie, so it was just eerie how I said, 'We should switch this and try to make a sequel to a movie we know is a hit,' which is 'Are We There Yet?' So it was eerie how the characters fit," Ice Cube told The Early Show co-anchor Julie Chen. The sequel fits seamlessly with "Are We There Yet?" because in the first movie, Persons is dating Suzanne, played by Nia Long. Now they are married and in addition to Suzanne's two children, she is expecting twins. "The first movie I was basically trying to get the girl," said Ice Cube, whose given name is O'Shea Jackson. "You know, now, you know, we're married. We're a family but we're living if a small apartment. And it's time to move to a … big house in the country. And anybody knows what a fixer-upper is, you know, it's never done. So that's what we really did. We just went out there and did this fixer-upper kind of thing. You know, had fun with it." McGinley's character, Chuck Mitchell Jr., drives Nick Persons crazy and their banter is what Ice Cube calls the "X-factor" of the movie. By the middle of the movie, the family has embraced Mitchell and Nick is the outsider. "Nobody's expecting John to come in and, you know, be this whirlwind of a character," he said. "He comes in and he's really great as he plays the construction guy — the real estate guy, the inspector, you know, so he's one of those guys if a small town who wears all the hats. He kind of drives me crazy like a 'What About Bob' feel." This time around, Ice Cube said the movie is geared more towards the entire family, not just children. Even still, his 6-year-old son brought his entire class to see a screening of it. "We went to the class and took a field trip. All of the other classes were jealous," he said. "That's the kind of stuff I cherish — being in the position to give my family, you know, the 'in' to do things like that." Being a father of four, Ice Cube said he could relate to Nick and how he has been forced to make the transition from bachelor to family man. "He's trying to keep a little of his individual, you know, ways about him," Ice Cube said. "But, you know, all that has to go to the wayside when you're a father." Ice Cube is also working on an album called "Raw Footage" and hopes it will be released this fall.